In 2003, Dr. Arthur Agatston, a cardiologist based in Florida, had grown increasingly concerned that the Atkins diet, a program based on the restriction of carbohydrates, encouraged dieters to consume far more saturated fats than was healthy. While it was clear that the diet could produce results, Dr. Agatston believed there was there was a better way to lose weight without increasing a person's risk of diabetes or heart disease. With years of hands-on medical experience to draw upon, Dr. Agatston went to his computer and created a program all his own. With that, the South Beach Diet was born. Both the South Beach and Atkins diet are structurally identical. Each is broken down into a two-week restrictive phase (Phase 1), a main weight loss phase (Phase 2), and the maintenance phase once you've achieved your ideal weight (Phase 3). Both restrict carbohydrates and identify which ones are "good" and which are "bad." The main differences between the two diets are that the South Beach diet has less saturated fat and doesn't limit non-starchy vegetables. It also introduces fruits, whole grains, and starchy vegetables into the diet far earlier, during Phase 2, when Atkin's allows only a small amount of fruit. In their place, you can choose high-protein foods like meats, poultry, pork, seafood, and some dairy. You would also be encouraged to eat lots of vegetables and to replace bad fats with healthy ones. Phase 1 lasts for 14 days. During this time, your carb intake would be limited to 10 percent of your daily calorie intake. (Most American diets are far higher than this, between 45 and 65 percent.) It is only in the final phase that the carb intake is increased to 28 percent of your daily intake, still well below the national average. During Phase 1, you eat three meals and two mandatory snacks per day, along with an optional sweet. By spreading mealtimes out to six times per day, the intake of nutrition would essentially be continuous, and you are less prone to fluctuations in blood sugar. According to Dr. Agatson, most people can expect to lose anywhere from 8 to 13 pounds (3.6 to 5.9 kilograms) during South Beach Phase 1. While it may seem daunting at first to have to give up bread, fruits, and other foods you love, you won't be starved. Rather, you are encouraged to eat heartily from a list of low-glycemic foods that are just as filling but far less likely to affect your blood sugar. You may be surprised at how long the list of approved foods is. All vegetables are allowed except beets, carrots, corn, turnips, yams, peas, potatoes, and most types of winter squash. To get a better idea of what the South Beach diet entails, it is important to look at how a typical daily meal plan is put together during Phase 1. Breakfast might include an omelet with smoked salmon or poached eggs with spinach and turkey sausage, accompanied by coffee or tea. With the exception of dairy, there is no restriction on the types of approved foods you can eat. While Dr. Agatston does offer suggested serving sizes, he encourages you to eat a little more if you are hungry rather than feeling deprived. Lunch may include a grilled salmon with spaghetti squash Alfredo or roasted skinless chicken with a three-bean salad. While the serving size of the protein is not limited, you should make every effort not to overeat to where you feel stuffed. 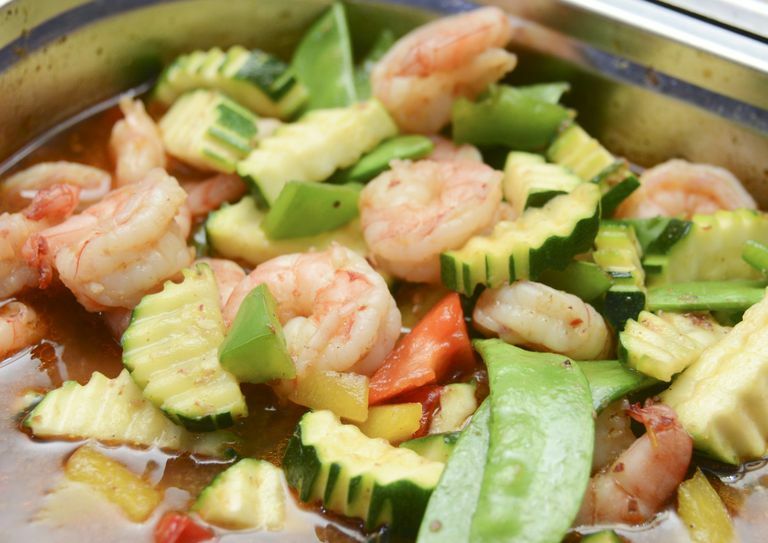 To stay satisfied, Dr. Agatston encourages dieters to switch things up as much as possible by finding low-carb recipes that deliver a variety of flavors, such as Italian, Asian, or Mexican. Among some of the popular recipes are pan-fried lemon chicken cutlets with green beans, grilled London broil with roasted asparagus and feta, and broiled halibut with curried cauliflower rice. The South Beach diet requires you to eat two snacks per day. The ideal snack would have both a vegetable and protein component. For example, you could stuff celery with tuna salad, dip raw vegetables into a bean dip, or make a lettuce, tomato, and lunch meat roll-up. Nuts are also excellent as they are a great source of protein, fiber, and monounsaturated fat. While dessert is not required on the South Beach diet, it is something that many people enjoy. By and large, many of the approved desserts involve flavored ricotta cheese. There are also a number of tasty sugar-free sweets that weigh in at a mere 75 calories. In the end, any acceptable snack is fine in the evening if you are hungry. The main goals are to avoid eating out of control and to consume enough to leave you satiated and not stuffed. While the South Beach diet is generally considered safe, there are some benefits and risks you should be aware of. Generally speaking, low-carb, high-protein diets are often effective in achieving significant weight loss. Part of this is due to the effects of added protein, which not only increases metabolism (the conversion of calories and oxygen into energy) but alters hormone levels so that you feel fuller and less prone to hunger pangs. In addition to weight loss, a 2010 study from Temple University concluded that a low-carb diet can significantly reduce blood pressure and triglyceride while increasing "good" high-density lipoprotein (HDL) cholesterol by an average of 23 percent. On the flip side, low carb diet poses potential risks. Among this is a condition known as ketosis in which the body, deprived of carbs, turns to stored fats as a fuel source. While many consider this to be a benefit (one central to a ketogenic diet), it can trigger an array of adverse symptoms, including nausea, headache, fatigue, bad breath ("keto breath"), dehydration, and dizziness. Foster, G.; Wyatt, H.; Hill, J. et al. Weight and metabolic outcomes after 2 years on a low-carbohydrate versus low-fat diet: a randomized trial. Ann Intern Med. 2010;153(3):147-57. DOI: 10.7326/0003-4819-153-3-201008030-00005. SBD Enterprises LLD. (2016) South Beach Diet: The Handbook. Washington, Pennsylvania: SBD Enterprises LLC.